Voice-enabled Pocket Client. No computers, no phones. My Pocket is a "Read it later" Alexa skill, meaning that it reads you the articles on the internet that you've saved for later. If you discover an interesting article but you're not free to read it right away, you can save it, then have Alexa read it back to you later. The skill is made possible using the Pocket service that enables you to save articles in an app or a web browser. Go to the Alexa companion app. Search for the skill, enable it, then it will prompt you for account linking. 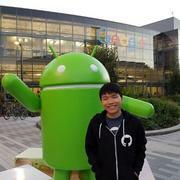 Finish the account linking process by authorizing the skill in Pocket. "Alexa, what is in My Pocket?" "Alexa, ask My Pocket to read me a random article"
"Alexa, what is in My Pocket with tag food"
My Pocket was published around a year ago, but it has been updated with a number of new features recently. 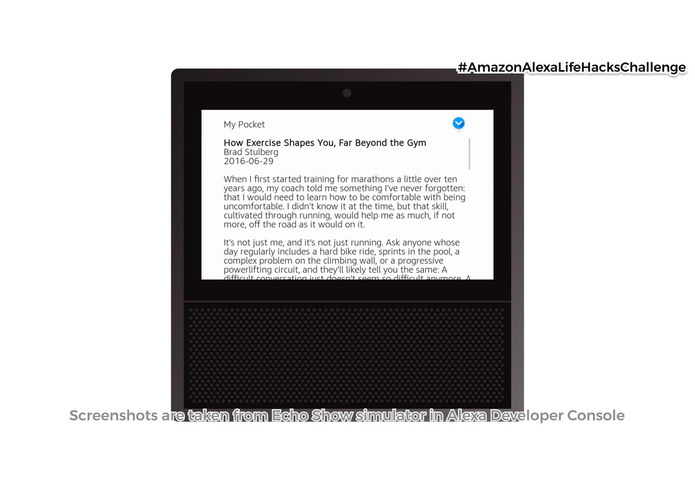 It now has support for Echo Show and Echo Spot, which allows these devices to display your article on the screen while reading it out to you. It can now perform many actions to an article after Alexa finished reading it to you. For example, you can favorite, archive, or delete an article. It can now differentiate articles under a certain tag. If you only want articles about food, say, Alexa, what is in my pocket with tag food, or, Alexa, ask my pocket to read me an article with tag food. It now has German translation. With My Pocket, you can save an article during the day, and have Alexa read it back to you as a bedtime story. You can save a recipe earlier in the week, then display it on Echo Show when you are cooking on the weekend. You will discover your own way to make use of this skill. My Pocket: Unofficial Pocket Skill is not affiliated, associated or endorsed by Pocket (Read It Later, Inc). Live on Alexa Skills Store, open source on GitHub.